This isn't just any old Baptist church in Watauga County. This is actually the polling site for the New River 3 Precinct, one of the largest precincts (in terms of population) in Watauga County. 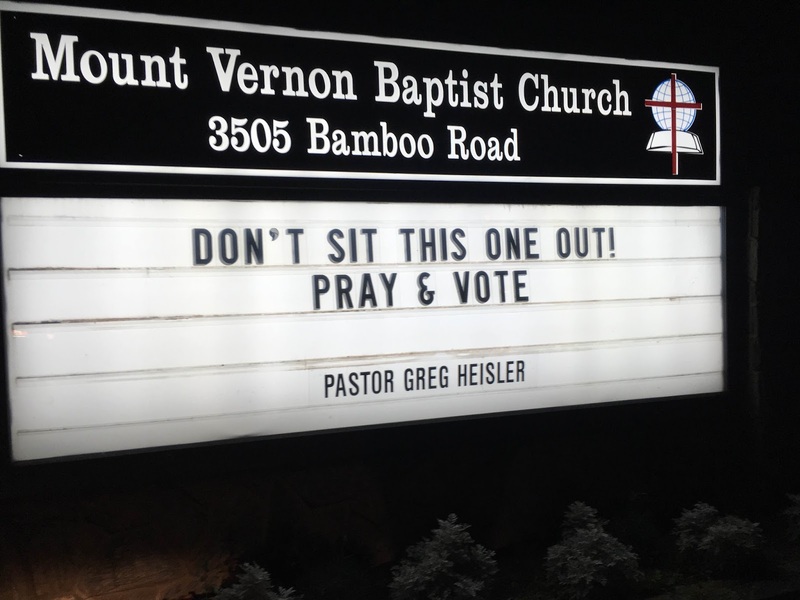 It's no secret that Mount Vernon Baptist Church is a hang-out for activist Republicans. It was chosen as a precinct polling place partly for that reason by Watauga BOE Chair Bill Aceto and County Attorney Four Eggers and partly because it is as far away from the suburban core of that precinct as you can get without actually leaving the precinct. It's in the middle of the countryside, miles from the population center and without any public transportation to reach it. 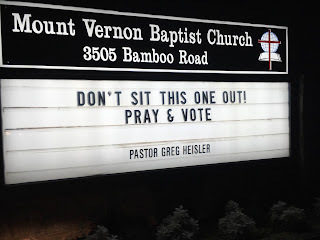 We know where the leadership of Mount Vernon Baptist Church stands on this election, and we know the meaning of this sign. It's not appropriate for an official polling place. The church is partisan. The sign is partisan. This polling place must be returned to the Boone National Guard Armory, where it was for many years, before another general election. How does this work? The entire student union on campus has shut down even the tvs so that no one can be influenced going in to vote. One rule for App and another for the GOP? You're absolutely correct. I just can't believe in a country that holds free and fair elections that this is even possible. Of course it's pro-Republican, and of course the sign is engaging in (still, somehow, tax-free) political advocacy. I can't see how this is acceptable to anyone, regardless of party. Those in favor of an American theocracy, I suppose. I'm a New River 3 voter. The Armory was a great polling place-- on the AppalCart routes, right by the Greenway for pedestrian and cycle commuters. But, our current BOE seems to have no tendency to put polling places...you know, where the concentrations of VOTERS ARE. You would think Appalcart could run a special route for one day. It shouldn't have to. There are plenty of logical places, centrally located in the precinct, to use as a polling location. The Armory was fine; just a little too central, accessible and convenient for the current board. Hopefully Roy Cooper will win today and Boards of Election will seek to extend the franchise across our state rather than limiting it. I remember when they first moved the precinct to Mt. Vernon. Someone (I think it was Aceto) said that it was on a "major road." In what universe is Bamboo Road a major road?? One good thing about this election is that if Cooper wins, the county boards of election will again be controlled by Democrats. May it be so!! Do you think the ASU site is impartial ? It's very partial and, oh so very convenient for your voters. And furthermore, you and your pals are so anti-Christian, it is disgusting. You don't want ANY Christian participation in the governmental process. Do you have any understanding AT ALL concerning the First Amendment? Jeff, so you think the First Amendment does not apply to Christians ? Christians should be silent while the atheists, the Marxists, the 'progressives' rule the scene. Right ? Is that your definition ?